Originally formed as Freewebs in the months following the ‘90s dot-com crash, Webs.com is now one of the longest-standing website builders on the Internet. And although the platform has evolved substantially over the years, does it continue to hold its own in comparison to the latest and greatest tools? Webs has come a long way since three brothers in Maryland launched the service back in 2001. The brothers’ goal was to give everyone in the world the ability to create their own website without needing any technical know-how. And although the online-printing service Vistaprint purchased Webs in 2011, the company continues to be headquartered in Maryland, and is as committed as ever to helping people build beautiful websites without busting their budgets. This Webs review focuses on the features and functionality of this builder’s drag-and-drop tools, and lets you know how easy-to-use this service really is. Just about anyone interested in building a unique website will find something to love about this platform. You can use the Webs website builder to create all sorts of sites, from blogs to business sites, and online portfolios to ecommerce stores. And since the Webs company offers a ton of different tools and a variety of free and paid plans to meet your needs, there’s a good chance that this builder can sufficiently handle any project you’re working on. Regardless of what kind of online presence you’d like to own, this builder is certainly worth taking a look at. 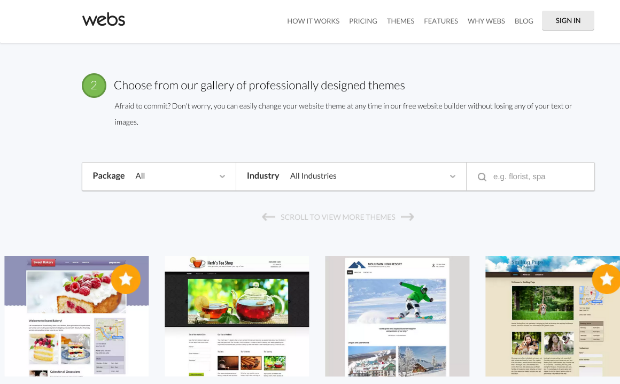 Check out how easy it is to use, when you create a Webs website today! One of the first decisions I had to make while signing up for an account on this platform was to select a look and feel that matched the concept for my site. I was truly impressed by the selection of Webs themes I could choose from. There were more than 200 distinct Webs website designs, divided into roughly 20 different categories. 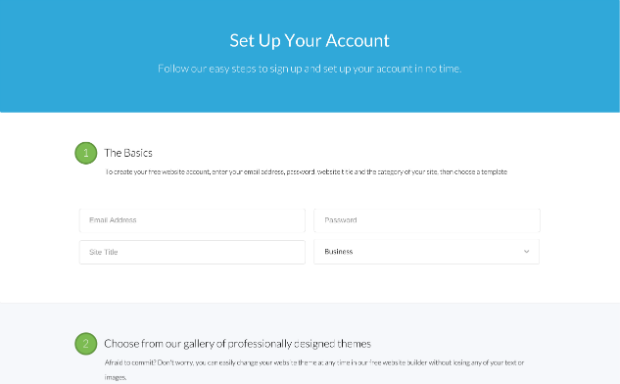 Most of the themes are free to use, but many others required a premium account to access. One thing that I really like about this platform is that you can use the Webs editor to switch to a different theme at any time, without requiring you to start over from scratch. Using the Webs website builder was an absolute pleasure. I found the layout of the interface clean and smartly designed, with all of the buttons and options exactly where I expected them to be. This was also true when it came to loading up my Webs store with sample products I wished to sell. And for community webmasters who want to create a membership site, Webs’ Facebook integration make it dead simple for users to log into your site with their existing Facebook account. One of the best things about this platform is that it allows you to create a website and keep it online forever without ever having to pay a dime. The catch is that your free site will feature Webs-branded advertising banners that you can’t remove. You’ll also be restricted from using your own domain name while you’re on the Free plan. If your needs are greater, the platform provides premium plans that might be a better fit for you and your businesses. Webs.com pricing is straightforward, and many of the plans are on par with competitors’ offerings. It’s easy to upgrade your plan at any time, and for even steeper savings, look for Webs’ best deals in the emails they send you after signing up for a free account. All of the paid plans on this platform include the removal of unwanted ads and the ability to use your own domain. You’re also provided with option to create more than the 10-page limit on Free plan, and directly contact customer support. Here’s a more detailed overview of Webs’ pricing for premium plans. Another neat aspect of this software is that it automatically creates a mobile-friendly version of your site, so visitors who browse your pages from a smartphone or tablet won’t have any problem viewing your content. While Webs’ mobile sites don’t technically employ responsive design--that is, they don’t dynamically rearrange your content to look great on any size screen--the standard mobile sites the platform creates should suffice for most cases. If you insist on having more control over your mobile site with Webs, HTML code of your own can be added only if you have the Pro plan. To get started in this department, search for a Webs tutorial to learn the basics and advanced steps. Though ecommerce isn’t exactly Webs’ strongest suit, the platform does provide plenty of options for those who wish to sell their wares online. Technically speaking, you can add PayPal buttons to just about any area of your site, but if you’re serious about ecommerce, your best bet is to upgrade to this platform’s Enhanced or Pro plans. When you upgrade to one of those premium tiers, you’ll have the ability to sell many more items, as well as access tools that track inventory and manage your customers. 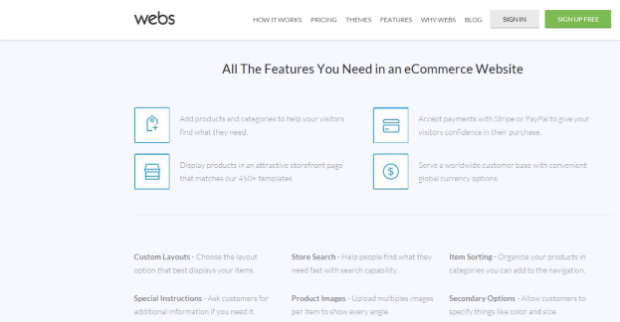 With Webs, free shipping options and coupon codes can also be set up with just a few clicks, making this builder a great ecommerce platform for many first-time entrepreneurs. Unfortunately, there’s no obvious way to sell digital downloads, but there are a few workarounds that aren’t hard to find. If you find yourself stuck with any aspect of your website, there are a few different ways to contact Webs support. Unfortunately, you need to pay for a premium plan to get any individualized help. Users of the free plan are welcome to look for answers to their questions in the support community forum, while paying users can take advantage of email, chat, or phone support, depending on their membership level. To call Webs’ customer service phone number, you’ll need to be on the Pro plan. The Enhanced plan offers chat support, while the Starter package restricts you to email support alone. If you’re a Pro member in need of some technical assistance, Webs’ phone number is 1-877-611-3285. In 2013, the company debuted the Webs.com SEO Booster. This tool helps users with Pro-level websites gain greater visibility in search engines. The Boosters works by identifying key phrases that, if added to you site, might increase its ranking in search engines. Another component of Webs’ SEO offerings is their Local Listings service. For an additional $6.99 per month, Webs will list your website in more than 100 online directories and search engines, including Google, Yahoo, and Bing. When you use this platform of to build your site, hosting is included at no additional cost. If you’re on the Free plan, your website will exist on Webs.com’s domain, which looks something like http://myawesomesite.webs.com. If, however, you upgrade to any of the paid plans on Webs, domain options are quite different. You can purchase a domain name from Webs, or, if you already own a domain with a separate registrar, you can follow some simple instructions to point the domain toward Webs’ nameservers. If you’d like to establish some email accounts to accompany your Webs website, you’re out of luck unless you upgrade to either the Enhanced or Pro plans. With the Enhanced plan, you have the freedom to create up to three Webs.com logins, whereas the Pro plan provides the flexibility to add as many as 25 separate Webs email logins. 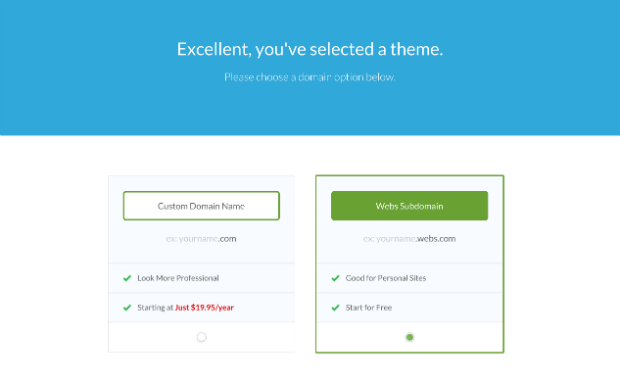 In either case, you’ll need to have a custom domain setup with your site. Then you can access your email by using your Webs login credentials, and clicking “Domains and Email” in the menu on the left side of the screen. On average, most Webs website builder reviews rate this tool as being better than average, but still far from the best platform out there. Most reviewers appreciate the fact that it’s possible to use the Webs free website builder to create a site that doesn’t cost anything, and that the site will remain online for as long as you’d like. Criticism about the builder, though, often stems from its lack of cutting-edge features that are common among more modern builders. Users also complain about some restrictions that Webs imposes, such as the inability to manipulate HTML code on the site, and lack of support for exporting your website to a different host. 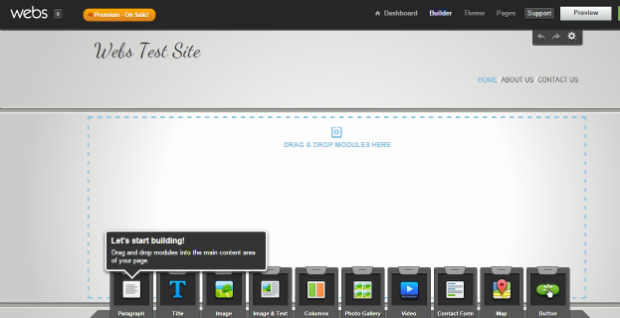 One of the best reasons to try this builder is to see how easy it is to create one of Webs’ free websites. It’s super simple to get started, and you don’t even need to enter any credit card information. With Webs, free websites only take a few minutes to create, yet they can stay published online for years to come, at absolutely no cost. While many builders out there promise that their websites are free, Webs truly delivers in that department, leaving you with no excuse to not test out the builder to see how well it works for you. Webs is a solid builder from a decent company that has a long history in the industry. The overall building experience is enjoyable, and the plans are much more affordable than many other builders are. That said, the software isn’t the latest and greatest, by any means, and more-advanced users might find this platform too restrictive for their needs. But, again, since it doesn’t cost anything to test out Webs and see what this company has to offer, it’s worth looking into. Michael is an expert copywriter from PACIFIC. He lives by the beach in San Diego and, in addition to writing about all things Internet for Top 10 Best, he enjoy movies, technology, and contributing to other print and online publications.